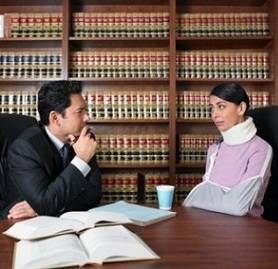 If you are looking for South African personal injury lawyers, you will be interested in the following helpful hints and tips in choosing the right attorney and where to find a good personal injury lawyer. Most people are somewhat daunted by the idea of hiring legal representation, but it does not have to be a difficult process if you know how to go about it. A personal injury lawyer will represent individuals who believe that they have had some wrong done to them that has caused physical or emotional injury to them. This sort of lawyer usually specialises in this field and will look after the interests and rights of individuals who have been wronged by other parties. The personal injury lawyer will attempt to get damages from the party who has allegedly caused the harm to their client. Without adequate legal representation, the individual is unlikely to get what is due to them. If you have had an individual or a company cause you harm in some way that is unlawful and you feel that you should receive damages from the party that caused you harm, then you should definitely look for a good personal injury lawyer to represent you. Your personal injury lawyer will review your situation and let you know what your rights are, what you should expect and what is not going to happen. Your lawyer will then look after your interests and protect your rights by fighting for justice and compensation. There are a great many lawyers available in South Africa, some are better and more experienced than others, and some should be avoided if possible. It is also important that you choose a lawyer that is right for you and your particular situation, as the individual who works for one person may not work for you. The following points will help you to decide which lawyer to go with. It is always a good idea to go for a lawyer (for any specific area of the law) who works for a well-known, reputable company that has experience and a happy and satisfied customer base. Look into reviews online, speak to friends, family and acquaintances about their experiences with a particular company and look at the firm’s success rate before deciding to go with them. Do some research into the qualifications that are necessary for a good lawyer, and also look at where a particular lawyer received their qualifications. Find out how many years a particular lawyer has worked for as you want to go for a personal injury lawyer who has a good bit of experience behind them. If a lawyer has good qualifications, comes from a good firm and has some experience, he or she will undoubtedly also have a high success rate. Ask for a record of the success rate of a potential lawyer before you decide to hire them. Your best bet, in finding a good lawyer for your needs, is to go for one who specialises in the field that you need representation in. This way, your lawyer will have very specific experience that could help your case. If you feel that you cannot trust your lawyer, or that your lawyer is not giving you time or not explaining things properly to you, then you should not go with him or her. A good personal injury lawyer will put you at ease, reassure you that they are looking after your best interests and keep you in the loop.